One of my favorite blogs to read is IHeart Organizing, mostly because I aspire to be that organized!! The author, Jen, decided to have a challenge for her readers this month to organize something about their kitchens. Now let me start by saying that I live in a rental and when I dream of a beautiful, well-organized, functional kitchen, the one I currently have is not it!! But I have done the best I can with what I have. I decided to pick something small about the space that bothered me and see what I could do about that for this challenge. The item that stood out the most was the way my husband and I handled our recycling. Yes, folks, we use boxes from the liquor store to hold the recycles! Now it is pretty convenient to pick up a box every couple weeks. It is also convenient that we can just put the entire box out to the curb on recycle day. However, what an eye-sore in my kitchen! The box above is actually the prettiest one I have seen! So, a new recycling container was in order. This wooden crate has been around for a long time. I have used it in the past as a display at crafts shows and also for storage in my old studio. Now it will have a new use as the temporary home for our recycles. 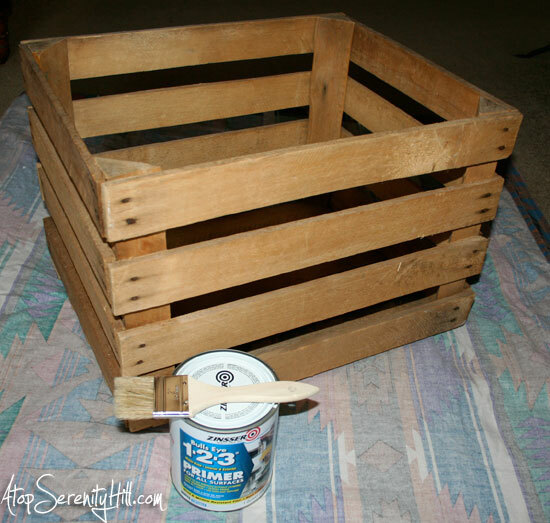 The first thing I did was prime the crate since it was bare wood. I wanted to be able to protect the wood as best I could since sometimes the recycle container sits on the curb in rain or snow. This didn’t matter when it was a cardboard box, but I wanted to be able to use the crate for a few years. The next step was to decide what I wanted to paint on it. This picture is horrible!! Sorry!! 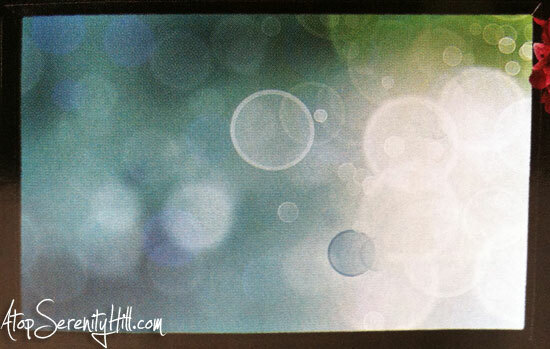 It is a shot of a TV screen from a catalog. I loved the color scheme with the blues and greens. Since recycling containers tend to be blue, I thought it would fit. I also loved the bubbles! 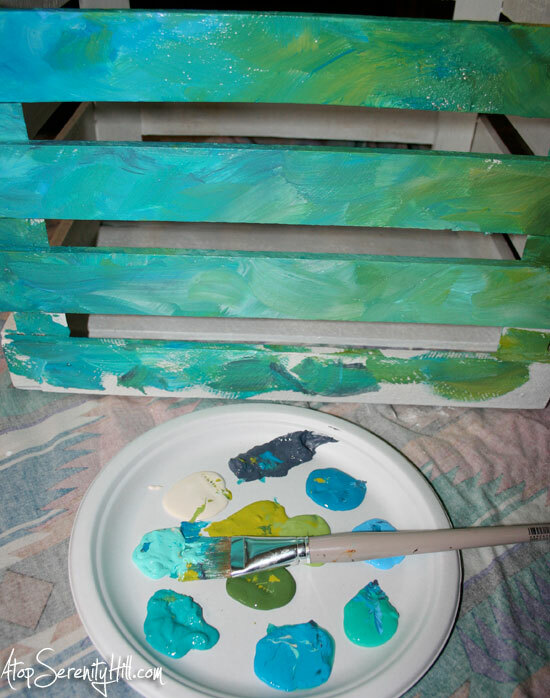 I chose some pretty blues and greens from my FolkArt acrylic paint collection and with a large, flat brush added streaks of paint all over the crate. I kept the colors I picked up very random and didn’t over blend so that you could see all the mixtures that are created. 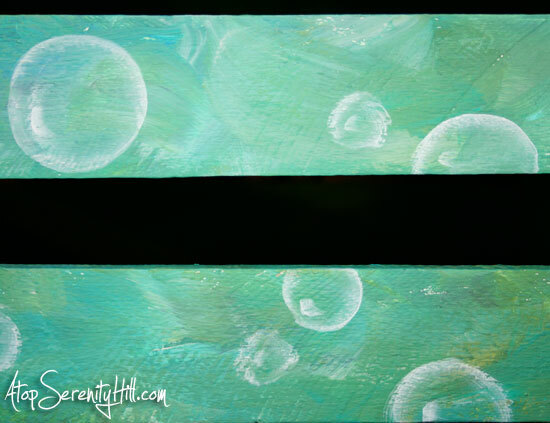 Once all the background paint was dry, I added bubbles on the sides with a 1/2″ angle brush. I loaded white acrylic paint in only the tip of the brush so that most of the bubble would have the background color show through. Since I was working on wood, I added a touch of FolkArt Floating Medium to the brush as well to help the paint flow more easily across the surface. The last step with the painting was to add a white highlight with the tip of the angle brush in each bubble to give them the illusion of dimension. The crate still needs to be sealed but unfortunately, it was raining today so I wasn’t able to do it for the photo. Sealing tends to make the paint colors just pop, so I can’t wait to see what it looks like! I will be using a spray sealer by Rust-Oleum. The sealer will be the final step in protecting the crate from the elements and will also make it easier to wipe the crate clean. I decided to add a sign to my crate so that I could make sure that the collectors left it behind on recycling day! I didn’t want to have spent all that time on my new container to have it be recycled!! I have included a link for you here should you wish to print out the sign for yourself. I laminated the sign, punched 4 holes and secured it to the crate with black zip-ties. I love our new addition to the kitchen! 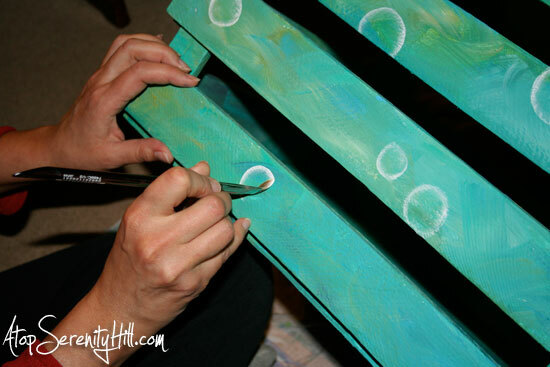 It will make me smile when I see it and add a bright spot in an otherwise beige space!! 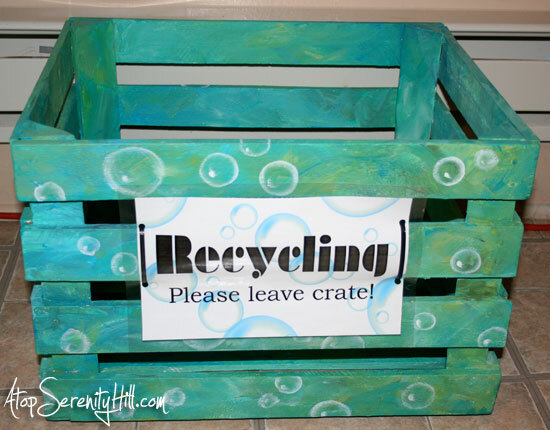 Do you use something fun and cheerful to hold your recycles? Thanks, Carrie! I will definitely check out Pinworthy Projects. Thanks for the invite! Well that came out as cute as could be, especially w/the bubbles! I’m visiting today from Sincerely Paula’s weekend hop. Thanks for visiting, Rosey.I do love this project. It makes me smile every time I walk into the kitchen! Where can you get these crates? You should be able to find something similar at a craft store in the wood department. That looks awesome! Stopping by from SITS! Thanks, Crystal! Just added my link at your Ladies Only Blog Share. Thanks for visiting, DeDe! I will head on over and check out your link party. 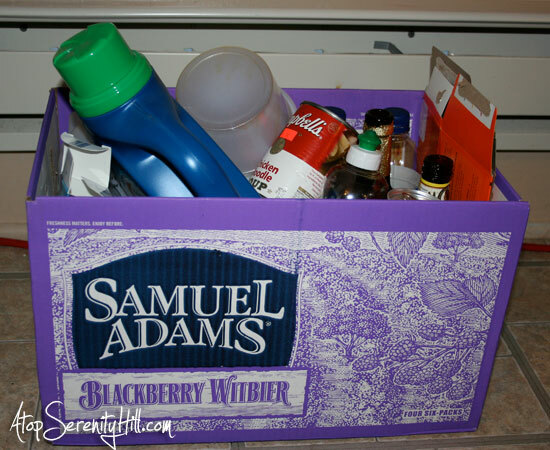 This is great way to stay organized and throw those recyclables away. Isn’t Jen just the best? I am completely addicted to her blog. Wow, I absolutely love it! The bubbles are the cutest! We just use a second trashcan to hold our recycling, then take it outside with the trash when it’s time for pickup. It works, but it’s nowhere near as cute! Thanks, Jessi! Our boring beige kitchen needed something fun. This helped immensely. Love what you did with the crate. How creative! We just get a big plastic can from the city that we have to use. Nothing individual or creative about it. Thanks, Johanna. Our recycling collectors didn’t offer anything which I am glad for as I could not have dealt with those so not attractive cans in my kitchen! This is such a cute idea! I’m visiting from Tater Tots and Jello! Thanks for visiting, Bonnie! …and for the compliment. Thanks for visiting, Jen! It was great to have a project to link up with! Your blog gave me a ton of inspiration and I love the way the project came out. You are welcome and thanks for visiting!! Good luck trying out your own version! Thanks, Jenna! I am not sure where the crate came from. I have had it for so many years! I would try a flea market or a “junk” type store. We have a couple of them around us. Some of the craft stores sell new versions of crates as well. Good luck!